Deputy Prime Minister Nick Clegg is taking part in a weekly phone-in for London's LBC radio station. With the Lib Dems flagging at nine per cent in the polls, Clegg announced the gig on the same day as the Government's Mid-Term Review. His 30-minute slot, dubbed 'Call Clegg', aims to 'keep in touch with how people are thinking and feeling'. 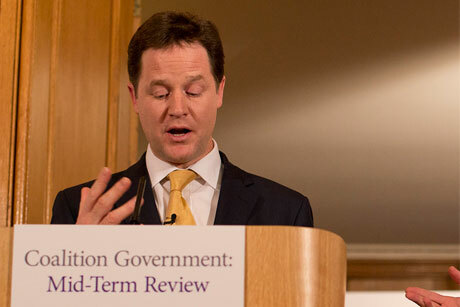 From this week, Clegg will be heard alongside presenter Nick Ferrari every Thursday. I would love to say this was a hit as I am a firm believer in direct communication. Taking the temperature here at Four, there was an undercurrent of personal respect for Nick Clegg putting himself on the line and a feeling that he has nothing to lose. Unfortunately, Clegg's position in the eyes of the public is far too deeply entrenched. He has lost trust for good because of early failed promises. Listeners who phone in will delight in reminding us of that. And the other parties will be busy lining up their supporters to phone in. Announcing this on the day of the coalition's mid-term update was also a strange move and a distraction. But maybe that was the point? The real winner, of course, is LBC, which has raised its profile and will undoubtedly get more listeners. So it's a hit for LBC, but certainly not for Clegg.